Toyota Motor Thailand Co.,Ltd. 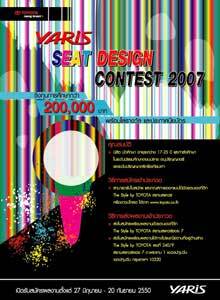 has activity “Yaris Seat Design Contest 2007”. Design seat of Toyota yaris for use free time to student and find new creative. Creative under concept “Yaris Hatchback Revolution” in design have to have Trendy, Sporty and Fashion also Logo Yaris.